We were off to my first airplane ride and miniature show. I did not have a doubt that Esther would be taking me along even though there was much talk about airport security and whether the flight would be canceled. Very early that Friday morning I was put into my travel case and we went to the airport having stopped to pick up Harriett. I was truly concerned about what was meant by security even though considerable talk centered around things made of metal. I knew I was made entirely of wood but it was frightening to be x-rayed and then have all the items in Esther's bag taken out and inspected. The inspector didn't like the tiny screw driver that Esther uses to tighten her glasses but after some discussion he let it pass. He just looked at me and said nothing. What a relief! I did not want to be taken away to an unknown place. Esther isn't afraid of flying and says it is an efficient way to travel even with some uncertain aspects. In a matter of a few short hours we were safely at our hotel and even our rooms were ready at such an early hour in the morning. This was a time to meet a lot of Esther's friends. Some of them had Hitty dolls like me and that very first afternoon I got to meet several of them. As you can see sometimes we even dress alike. I know mature ladies don't like to do that in their own clothing but we dolls think it is a mark of distinction. I am the one on the far right and the others belong to Esther's friend Barbara. That first afternoon the conversation was mostly about us. Since I am not familiar with miniatures this seemed to me to be a suitable topic. That evening we attended a Preview and I went along in my travel case. In and out and in and out but it was exciting. Many people were surprised that Esther had a doll! She has been in miniatures for quite some time and this was quite a departure from what she normally collects. She was looking for and actually found quite a few china animals for the room that I will eventually occupy. Most of the items at this show were in 1/12th scale but she also found two lovely pitchers the correct size. Saturday was another exciting day for me even though I had a rather traumatic moment! I was so relieved that it was only a tiny second of concern. There were six ladies at lunch downstairs in the restaurant sitting around a large round table. One of the ladies directly across from Esther asked if she could see me up closer so she sat me on the table, its surface was very smooth, and gave me a gentle push toward the lady. Well, I did not go straight! I sailed slightly to the left and headed for a plate of food in front of a lady named Marilyn! Everyone gasped in horror! Marilyn moved the plate instantly and stopped me before I came to the end of table. It was a most frightening moment. It was a relief to be back in safe hands and Esther was certainly apologetic. That afternoon we visited with Mr. & Mrs. Fifer and Barbara in our room. Both Barbara and Esther wanted to see the "Perfume Hitty" that the Fifers brought. It is molded and the head comes off so that perfume may be put into the vial in the body of the doll. She looked quite a bit like the original Hitty but of course, she was not hand carved wood. The Fifers collect Hitty dolls from various artists and in various sizes. Esther had brought along two very tiny dolls of different characters to show them. 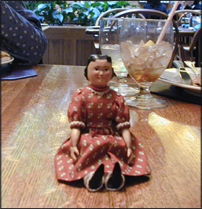 One was a tiny doll that she had received as a souvenir one year when she went to the Ashland miniature show. This was a time for exchanging information. Mr. Fifer told about the various other doll artists that carve Hitty dolls. It was very helpful since Esther is new to the world of Hitty. Over the week-end there were many discussions as to whether I was to remain an only doll or have some companions. I understand that to Esther this was a big decision since little did she know that people usually do not have just one Hitty doll when they become a Hitty fan. She met a lady that has over 80! There were Hitty dolls at this show in several sizes and from two different makers but she did not buy any of them. I think she will probably make the final decision after the coming holidays. Esther and Barbara both placed orders with a lady named Connie to make bonnets like the one pictured in the Hitty book. She has made beautiful hats for both in the past and she said she would enjoy the challenge of making a cloth bonnet as well as a straw bonnet. Esther told her the whole Hitty story and she was quite interested and plans to read the book. When we got home pictures of the bonnet and my journal were sent to her via email. Maybe she will become a Hitty fan also. We had an uneventful trip home. Airport security was not as unsettling as that first time. I am back sitting on my bench watching Esther work on the sampler. She has started over for the third time! She found an error that could not be corrected in the second one. It was nearly finished! What a disappointment but she is determined that there will be a finished sampler.